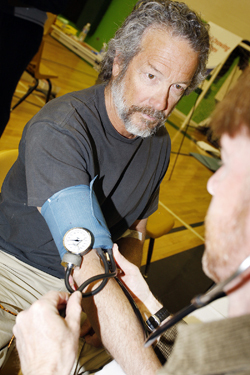 St. Luke’s Wood River Medical Center respiratory therapist Dan Biggins checks Bill Cortlett’s blood pressure at the free Heart of the Matter annual health-screening session at the Community Campus in Hailey Thursday morning. Some 400 people were tested for blood cholesterol, glucose and PSA, blood pressure and cardiac risk. Sponsored by St. Luke’s Center for Community Health, the event also featured informational tables with St. Luke’s Idaho Elks Rehabilitation, EMS professionals talking about emergency services and St. Luke’s nutritionist Becky McCarver giving out information on diabetes and nutrition. St. Luke’s Wood River staff also handed out various freebies, including healthy breakfast treats. The next Heart of the Matter will take place from 7 a.m. to 10 a.m. Saturday, April 19, at St. Luke’s Wood River, south of Ketchum. Border fence—the new symbol of creeping police state?